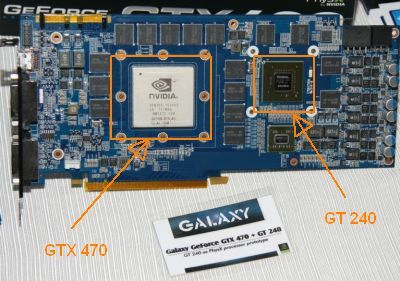 Galaxy is presenting at Computex 2010 a prototype of a dual-GPU graphics card that includes a GTX 470 for graphics rendering and a GT 240 for processing PhysX. 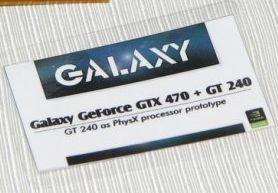 Galaxy’s graphics card follows the same principle than EVGA’s GTX 275 CO-OP PhysX: GTX275 for 3D and GTS250 for PhysX. A PhysX test of a GTX 480 + GT 240 is available HERE. would be nice if they hooked up displays from the GT 240…4 heads on a nvidia based card would be schweet!..might make it possable to run 3D Surround Vision on it too!